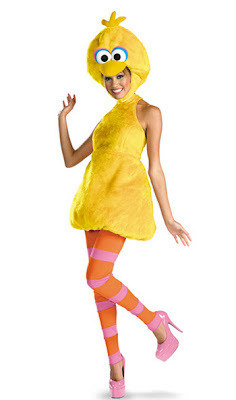 Last Friday, I mentioned that I wasn't the biggest fan of one of my childhood Halloween costumes: Big Bird. Well, I may have to amend that a bit! I discovered this adult version over the weekend and wish I had it for this year. Alas, I think that since this Halloween falls on a Monday and because I don't get Trick-or-Treaters at my place, I'll curl up on the couch and watch freaky movies until my boyfriend leaves for work. Then I'll do Halloween "Jen style" with a spooky cocktail and the remaining episodes of True Blood! How are you spending All Hallows' Eve? Oooh, I wish I still had True Blood episodes to watch. Love that show so much. I partied this weekend so tonight I spent the evening with The Walking Dead and The Slutty Pumpin. All caught up on my True Blood! love the leggings and shoes with that costume ... very cute. I've only watched the show ... so far ;) I'd love to read the books. How many are there right now? so far their has been 11 of them, I didn't read the books until after watching the show and surprisingly I found I actually preferred it that way! If I had read some of the books first I honestly don't know if I would have kept reading them ... don't get me wrong, they are enjoyable, but I don't find the author to be as in depth as many of the authors I enjoy ... but since I already loved the characters I loved getting more background knowledge about them so I kept going, and the books got better, and the writing gets better ... but she's more of what I consider my "weekend reading" ... the stuff that's kind of a guilty pleasure and that you tend to be able to read quicker than usual, does that make any sense? lol But Target usually has the paperbacks at a good price, so I would totally recommend picking up a couple! I need to start reading more. I've found that balancing my writing and reading is more difficult that I ever would have imagined. I think I need an entire vampire bookshelf, lol. Between Anne Rice, True Blood, The Vampire Diaries, Twilight, Buffy, etc. I could use a space just for the blood suckers! I highly recommend reading I, Vampire by Michael Romkey! It was a favorite of mine in high school.